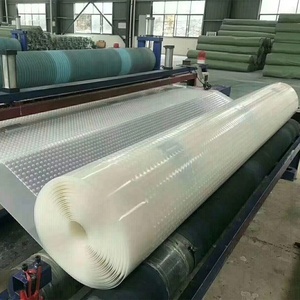 It is an air-gap membrane with a geotextile cloth on one side,which provides a drainage path,with the function of drainage and filteration. 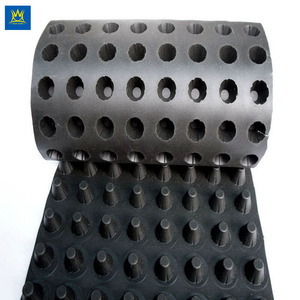 It can be used for civil engineering projects such as retaining walls,landscaping drainage,parking decks,etc and mostly used for basement walls,tunnels drainage. 3, Construction engineering : upper or bottom layer of building foundation, basement wall, bedding filtration and heat insulation. 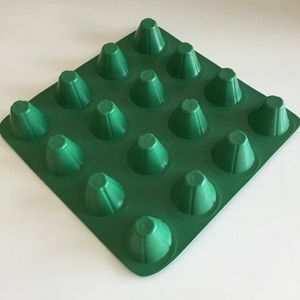 3 YRS Shandong Daxing New Materials Technology Co., Ltd.
30mm Roofing Garden Plastic Drainage Cell Plastic Drainage Cell Description: manufacturer of drainage cell is a narrow profile, high strength, lightweight interlocking plastic drainage cell. 330x330x30 mm drainage plate is moulded into a unique profile and then wrapped in a filtration geotextile which then provides a complete void space for the water to travel horizontally without any obstruction. Its lightweight, high compressive strength makes the product ideal for roof gardens & podium landscaping, retaining walls, sports fields & golf courses, under drains for slabs and foundations and subsurface drainage for permeable driveways and car parks. Go to the world and service the world,we intent to take your hands to create one brilliant future in building materials industry. Q:How to deal with the sample charge9 A : We can provide you samples for quality inspection. At the same time, please rest assured that your information is also safe here. 1 YRS Dongguan Haoyi Building Materials Technology Co., Ltd.
Also called "Self-adhesive PE drainage sheet,Row of thin plate, Drainage protection sheet, The filter plate, Plastic concave and convex drainage sheet, profile plastic sheet. 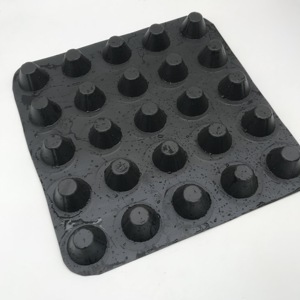 Water resistant Polyethylene (HDPE) is a good waterproof material in itself, and it can be used as a good auxiliary waterproof material by reliable connection mode. Protective protection The protective shield can effectively protect the structure and waterproof layer, and resist the root spines of all kinds of acid base and plant in the soil. 4 YRS Taian Forever Import&Export Co., Ltd. 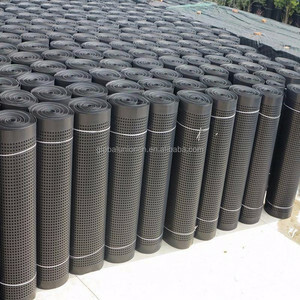 Plastic Grass Lawn Grid Grass grid is made of high-strength HDPE or PP broadband, which are welded into a piece of netty cell structure, it can be stretched out and folded easily. It can be folded in course of conveyance while being stretched out; soil, stone or concrete can be filled into it, which will become a structure body with big side restriction and high strength. It can be used as a cushion to deal with weak foundation increasing the load capacity, and can also be laid on the slope to be made up the protecting structure. 4 YRS Shandong Mount Tai Project Material Co., Ltd.
5 YRS Taian ZT Industrial And Trading Co., Ltd.
13 YRS Hong Xiang New Geo-Material Co., Ltd.
3 YRS Zhejiang Hengsite Plastic Co., Ltd.
Can resist long-term high pressure without deformation. 3, Construction engineering : upper or bottom layer of building foundation, basement wall, bedding filtration and heat insulation. 4, Traffic engineering: highway, railway basement, dam and slope. 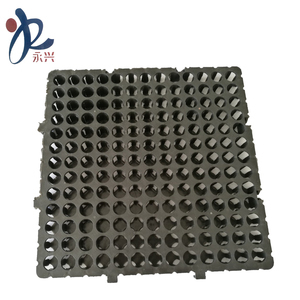 11 YRS Weifang City Huateng Plastic Products Co., Ltd.
drainage board cell is made of PP with high impact resistance and pressure resistance which can resist long term high pressure,and will not generate deformation. 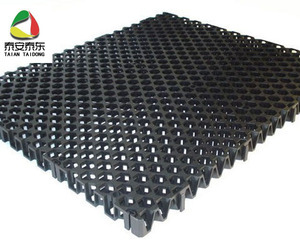 The long term pressure resistance not only can resist weight of concrete bottom plate and its load,but also can bear unavoidable outside pressure and impact force during construction. Social Project:ground water and surface water drainage in roadbed, tunnel underground and waste landfill site Building engineering:river diversion and drainage in building foundation, basement, roof, and lagging. 2 YRS Anping Jingteng Wire Mesh Products Co., Ltd.
5.Welcome to our factory and inspect the goods quality at any time. The products and shipment pictures will be provided if no final inspection. 3). We can refund you the air shipping charge when you place next order with us. 11 YRS Feicheng Lianyi Engineering Plastics Co., Ltd. The plate has two comprehensive functions of reserving water and discharging water originally. 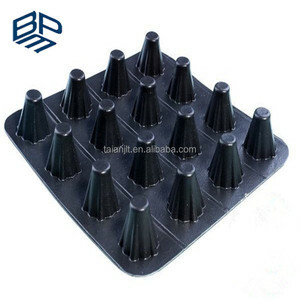 5.we can provide the free sample to you to know our product better . According to our company policy, we will return the freight to you when you place the order. 4 YRS Shandong Luke Composite Co., Ltd. 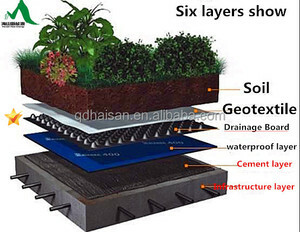 Product Application Plastic drainage board drainage cell plate sheet Landscape engineering, garage top greening, roof garden, football field, golf course, beach project. Construction engineering, upper or bottom layer of building foundation, basement wall, bedding filtration and heat insulation. , Ltd is professional manufacturer of geo materials in Shandong China, include hdpe geomembrane, geotextile, geomat, drain board, etc. 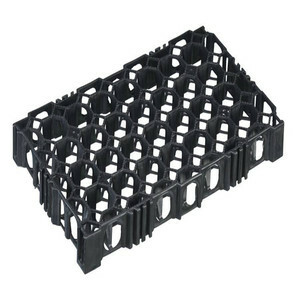 Alibaba.com offers 2,034 drainage cell products. About 13% of these are other earthwork products, 2% are other plastic building materials, and 1% are geomembranes. A wide variety of drainage cell options are available to you, such as free samples, paid samples. There are 2,034 drainage cell suppliers, mainly located in Asia. The top supplying country is China (Mainland), which supply 100% of drainage cell respectively. Drainage cell products are most popular in Western Europe, Eastern Europe, and Northern Europe. You can ensure product safety by selecting from certified suppliers, including 903 with ISO9001, 398 with ISO14001, and 324 with OHSAS18001 certification.